The image was made in a Beech woodland in the U.K in an area it has taken me a few years to locate. I would walk through these vast woodlands each spring trying desperately to locate a section where the forest floor was uncluttered, the bluebells were dense providing a decent colourful display and also where the early morning light would break through the trees and illuminate sections whilst leaving others in shadow. When I finally worked out the location it took another year to to get a subtle mist just to help with the highlights a little also and add to the atmosphere I wanted to create. The image was made on a canon 1dsmkiii using an old Contax/Yashica mount Zeiss 35-70 lens. The micro contrast of this particular lens is phenomenal, perfect for a detailed image like this. I wanted to capture a typical New Forest scene at around dawn. The weather forecast was for mist/fog and I knew that if it appeared, it would linger at a favourite location in the Forest due primarily to the depression of the land. Below are the six favorite pictures from John Deines on the Fall 2011 Photo Tour. Allstones Creek gave us opportunities in landscapes and macros. 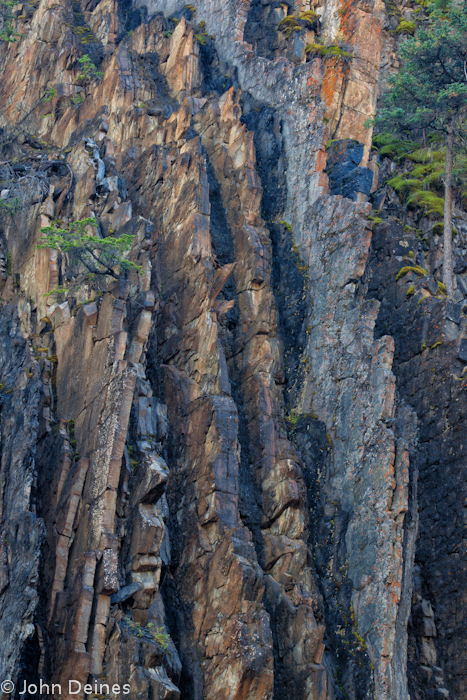 Here, I present the image of a cliff which shows a vertical pattern of alternating layers of rock. I was impressed with different rates of erosion between the brown and gray layers and the darker or black layers. Splashes of green show the life that clings to the steep fins. Canon 50D, 24-105 f/4L, 100 ISO, 55mm, 0.6s, f/11. 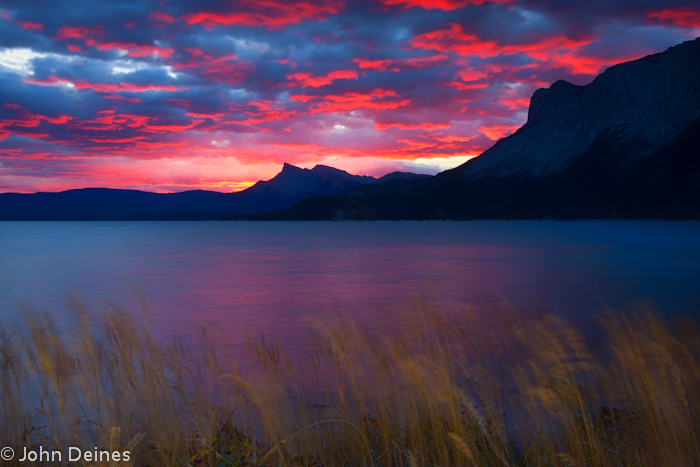 Sunrise on a somewhat windy morning on Abraham Lake presented a beautiful sky of red and dark clouds. I chose to keep the mountains in silhouette to preserve the intensity of the sky and light painted the blowing grasses in front of the camera to provide some foreground. The four second exposure smoothed the lake waters somewhat. Canon 50D, 10-22 EFS, 200 ISO, 22mm, 4s, f/22. 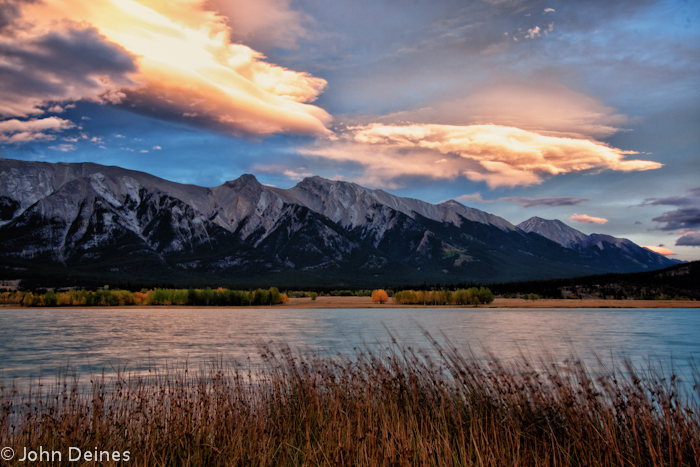 As we waited at Preachers Point, a set of vaguely lenticular clouds caught the gold and pink rays of the setting sun. The wild grasses on the near shore provided a nice foreground and the sprinkle of yellow-gold trees on the distant shore provide some mid-range interest. Canon 50D, 10-22 EFS, 200 ISO, 22mm, 1.3s, f/22. The Nordegg Mine site was a treasure trove of images. 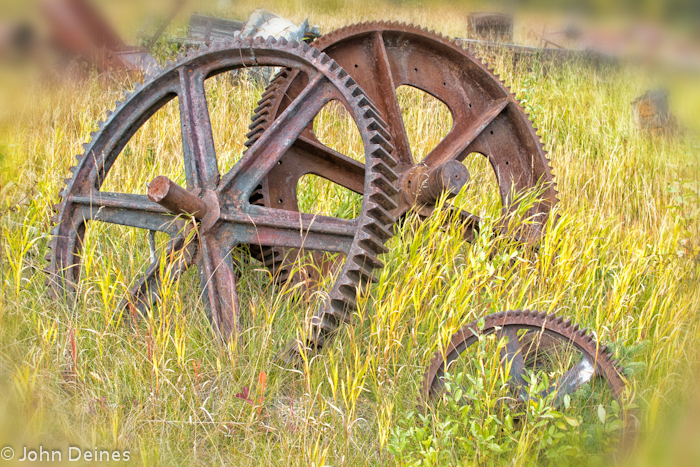 One image that represented to me the past life of the mine and the impact of machinery on the process of mining coal was this set of three gears balanced in the grass. A little post processing to blur out or vignette the edges of the frame amplify the focus of the image. Canon Powershot G12, 80 ISO, 11mm, 1/100s, f/4. 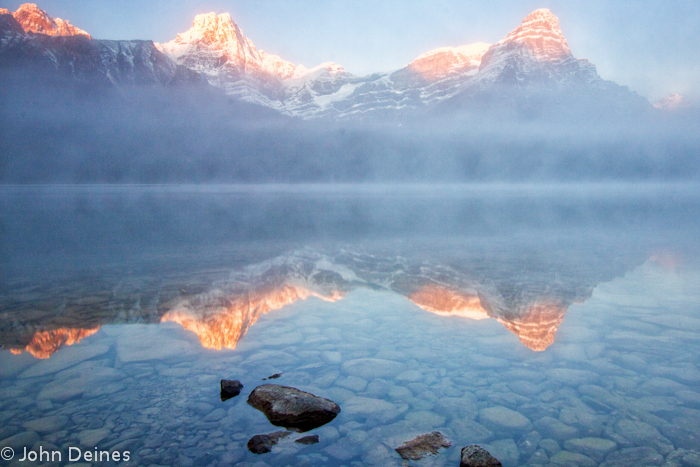 Upper Waterfowl Lake presented us with the rising sun behind us, trying to illuminate the peaks through a heavy mist. My early frames such as this one, showed color in the mountain tops and reflections, through the thickening mist which almost obscured the forested shoreline across the lake. Canon 50D, 10-22 EFS, 400 ISO, 14mm, 1s, f/22. 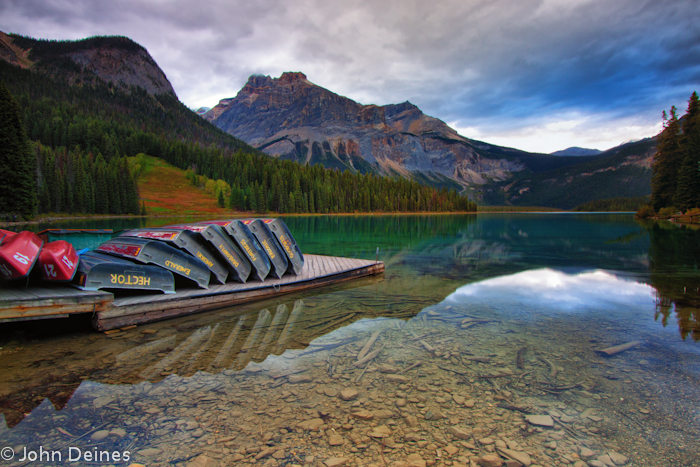 This boat dock on Emerald Lake in Yoho National Park, BC, provided some nice color and pattern leading to the emerald colored water beyond. Canon 50D, 10-22 EFS, 100 ISO, 13mm, 5s, f/16.